You want to move to Chang Mai (Thailand) & experiment the digital nomad lifestyle? Me too. And that’s what I just did so here are my house hunting tips from that experience. You often see the words apartments/studios/flats interchangeably online & in this very post. They all usually mean the same unless specified otherwise: a bedroom with a double bed, a private bathroom, fan or AC, & more sometimes (fridge, TV, phone, wifi). 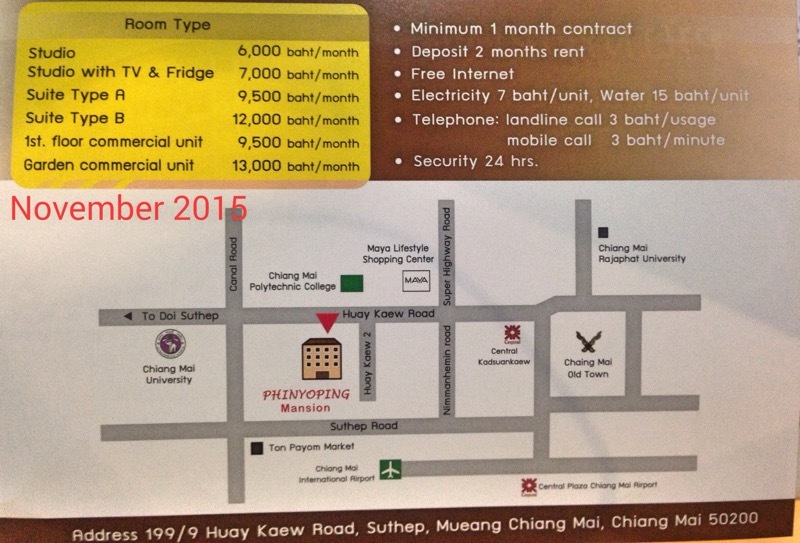 Prices range from 3’000 to 20’000 Baht per month for a studio, depending on standards. 2’500 to 4’000: small room, basic (hard) mattress, usually not very bright, & generally quite old apartment/building. 6’000 to 12’000: bright & more spacious, super clean in almost brand new apartment/building, security, & sometimes a swimming pool. 12’000+: not exactly sure what else you get for that price range really, feel free to leave a comment to enlighten me! Bills are usually excluded from the prices indicated, you will have to add to the final bill at least: water, electricity & cleaning fee (when you move out). Ask details on the fees for those additional bills, as some place have much higher (read “double”) prices than other. Note that landlords often (always?) charge a fee for booking an apartment in advance. Another price to pay (pun intended) for the luxury of peace of mind I suppose. Staying in the regular hotel or guesthouse usually costs around 10 times a daily rate. 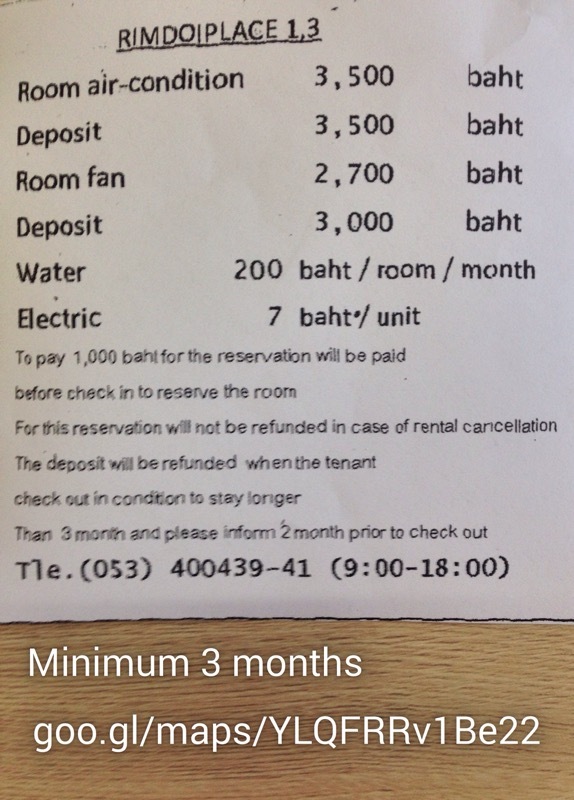 So for instance, if you pay 300 Baht per night, it will be around 3’000 Baht per month. I have also experienced that in Bali actually, but not every place will provide this option so you must shop around. Booking in advance is possible, but it’s southeast Asia, so I knew that if I just turned up I would have better prices & I would know exactly what I sign up for. Mind that NOT everything is listed online, nor is the info up-to-date (contact details, available deals). Staying in a guesthouse in the old town is probably the nicest way to start a stay in Chiang Mai, enjoy a bit of tourism while doing some house hunting. Again, there is no need to book in advance (I rarely do in southeast Asia), Chiang Mai is full of accommodation so if you can’t extend a stay you can always move the guesthouse next door. So that’s what I did, after arriving with this funny Chinese guy I met in Chiang Rai, we went guesthouse hunting & found quite a few places with either private rooms (around 350 Baht per night) or beds in dorm (around 170 Baht per night). Get a motorbike or bicycle to independently look for your accommodation around town. You can rent those in many places whether it’s on a daily or monthly base. 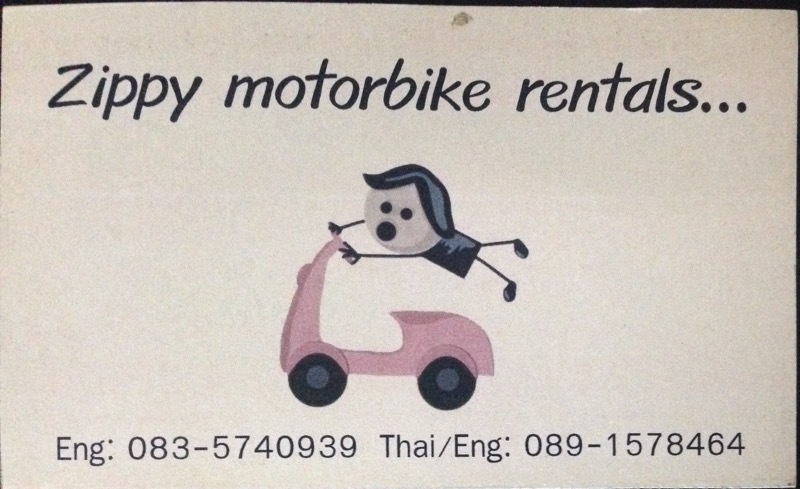 I rented a fully automatic 125cc scooter with Zippy mortorbikes rental for 2’500 Baht for 1 month, Jacob who runs the company is nice & easy to communicate with. It’s best to contact Jacob directly on Facebook or by phone. Visit flats during office hours (any day) as the information desks located at the bottom of every serviced apartments’ building is usually open every day from 9:00 to 18:00. You may want to explore the neighbourhood at night though, check if there is not any noisy bar close by. Use forums & blogs to find info: the expat community is a large part of the population, so there is plenty of resources online, whether it’s about accommodation, motorbike rentals, neighbourhood, co-working spaces, restaurants, activities & much more. I found the digital nomad forums & blogs very helpful (no wonder!). I found a monthly accommodation in 24h! 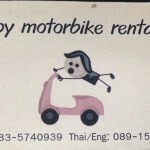 I started to look for accommodation & motorbike monthly rental on the Monday afternoon, by the same evening I had my scooter (which I used to look for serviced apartments) & Tuesday afternoon I agreed on the apartment rental terms with my landlady. I moved in a few hours later. How simple is that!? I listed (from cheapest to most expensive) below all the decent monthly accommodations I found during my research & also those I came across afterwards. Thanks to readers who tipped me on additional accommodations. 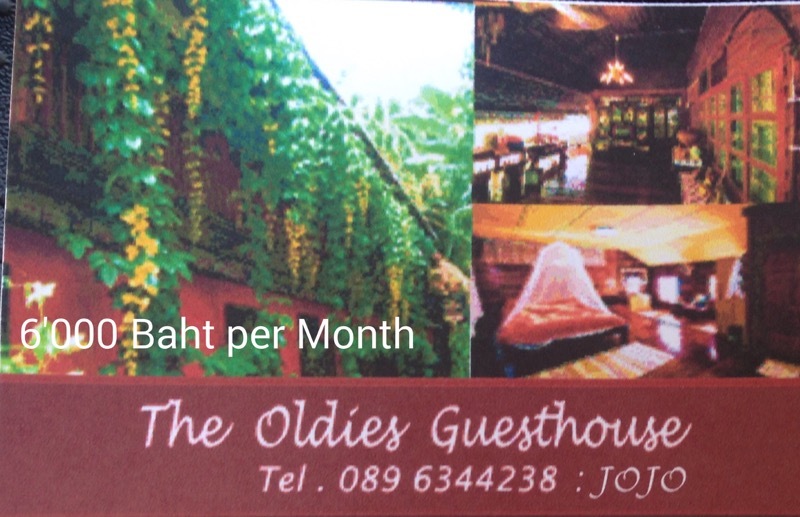 Serviced apartments from 2’700 Baht per month. Located in the old town, it has the advantage of being very central. The address is 5 Soi 1A Samian road, here exactly goo.gl/maps/NdsUkDcTvhG2. The place is not new (read: it’s pretty old), but it does the job if you’re on a budget. It has a small local restaurant with local food at local prices (dishes for 40Baht). Serviced apartments from 3500 Baht per month. Located at 85 Klong Cholprathan road, here exactly goo.gl/maps/VP55V1kDf7H2. Brand new serviced apartments from 3’500 Baht per month, unbeatable! 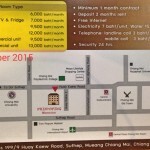 Located here exactly goo.gl/maps/7pjdyDEDT142, it only accepts rentals of minimum 3 months though. The place is brand new & still seems to be built so not sure how good this place is, just go check it out! Serviced apartments from 3’900 Baht per month. 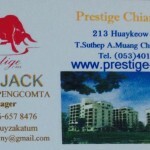 Located at 213 Huaykaew road, here exactly goo.gl/maps/ALFYy5Nc9S12. Prestige is actually a group of 4 buildings: the upmarket one is the hotel & the others are used for serviced apartments. Apparently the whole 4 buildings is rebranded as “Prestige” but it used to be called P&S mansion, the woman at the reception seemed pretty confused about the whole thing herself. 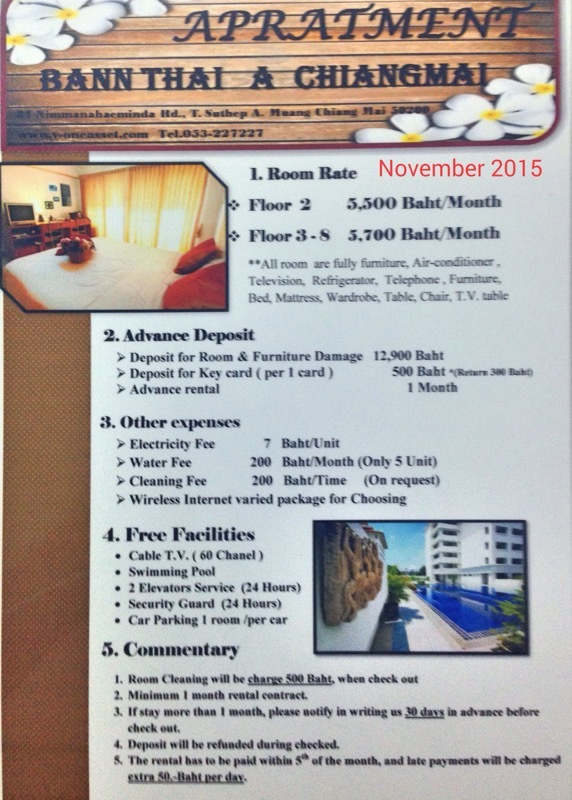 Serviced apartments from 4’500 Baht per month. Located at 3 Soi Mengrairasmi. Find Nara Apartments on Facebook. Very famous in the local digital nomad community as it offers great value for money, starting at 6’000 Baht per month. Located at Soi 6 of Nimmanahaeminda road, here exactly goo.gl/maps/QgeLb7JnV5y. Bonus points for the big swimming pool and mountain view. Find Baan Thai on Facebook. 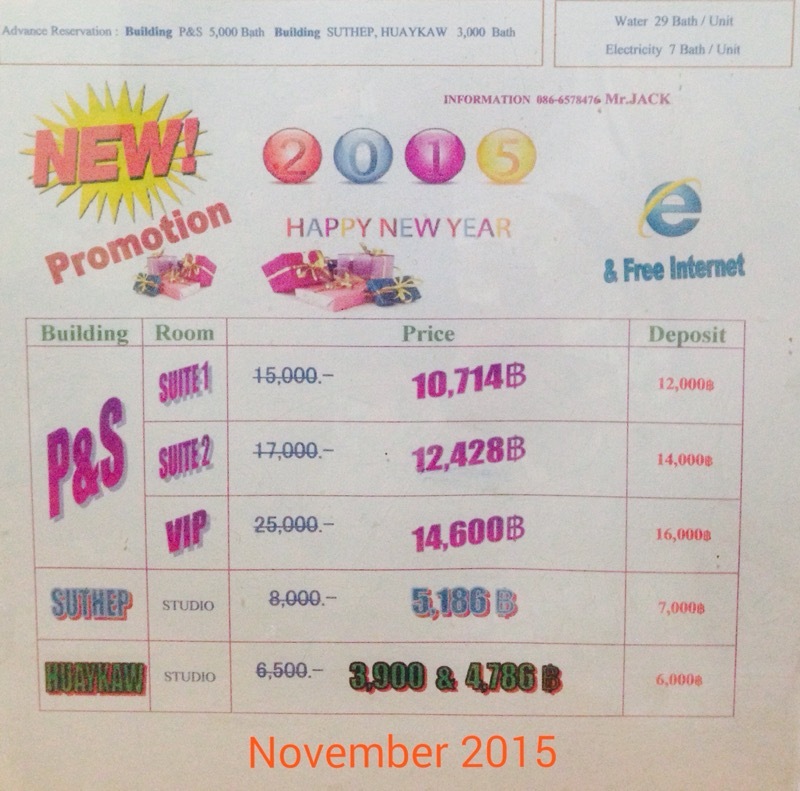 Serviced apartments from 6’000 Baht per month (4’000 Baht deposit). Located at 51 Sirimungklajarn road, here exactly goo.gl/maps/Usj3BpC4oVw. 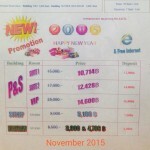 Tel: +6653894665. EDIT: Phinyoping does NOT provide mattress! A reader contacted me to let me know about this. Very strange fact indeed. 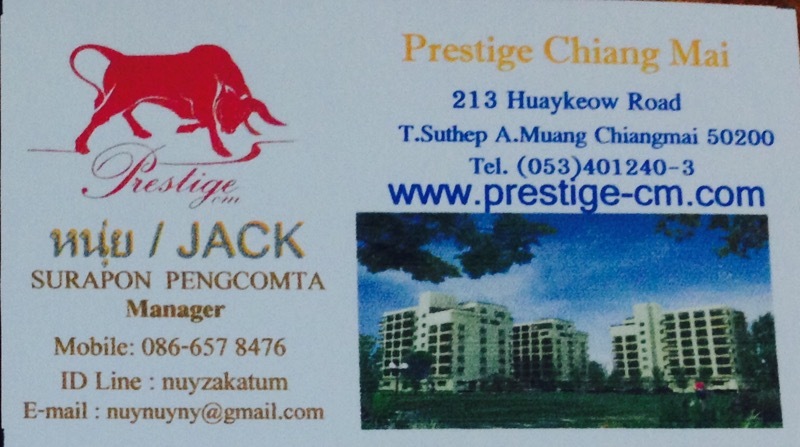 Serviced apartments from 6’000 Baht per month. The building looks brand new & so are the apartments for rent: extremely clean & brand new. Located at 9 Huay Kaew road, here exactly goo.gl/maps/fjcuigmZqiK2. Double rooms for rent on a monthly basis for 6’000 Bath. Located in the old town, here exactly goo.gl/maps/2ZVWEDLiaPz. If you want something that feels more like a cosy home with a local family, that’s the place to stay. 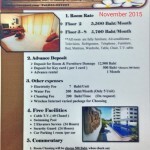 Serviced apartments from 7’000 Baht per month. Located at Santisuk Soi 2, here exactly goo.gl/maps/3JA3YnZT1AB2. Find P Place on Facebook. Pet friendly serviced apartments from 9’000 Baht per month. Located here exactly goo.gl/maps/A6hB55qSfp42.Thai-minimal style, outdoor kitchen area, huge balcony. Comes with wardrobe, desk, bed & nightstands. Pet friendly serviced apartments from 12’000 Bath per month. 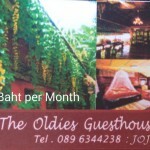 Located at 35 Moo1 Tambon Changpuak, here exactly goo.gl/maps/BptjXGh1jt42. More on Flora House ‘s website. Serviced apartments from 13’000 Baht per month, it is very modern & is fully supplied with kitchen and more. The building has a small pool and a gym. Find PromT on Facebook. PromT also has a website, but it does not seem up to date. Disclaimer: before leaving any request on the FB groups, please double check no-one already asked the same question just a few days before. The information here was a great help for me. Thank you so much for collecting it all here. – Baan Thai’s map is incorrect. It is located at Soi 6 of Nimmanahaeminda Rd. They information desk was closed at around noon. – P Place is full till February. – Phinyoping looks great and modern but contains only the bare minimum: bed with mattress, light, drawer, bathroom, one lamp. You will need to purchase some basic amenities yourself which might be no option if you only stay for one month. – Prestige is fullly booked until December. – I couldn’t find Zippy bikes shop, but wrote them a message. The owner is out of town until Bangkok. Hi Jan, thanks for the compliment & the updates! I corrected the relevant info in the post. Good flat hunting! Adrien. Red Ride here in Chiang Mai is a great place to get bikes at a monthly or weekly rate. Monthly as low as 1200B for a semi-automatic. You can find them on Facebook. Hi Austin, I just found Red Ride on Facebook and they do seem to have very good deals. The map of their location on Facebook seem incorrect though so try to contact them directly via message or phone. So in the end which appartment did you choose? The cheapest I could find. I’m not making any money at the moment & I’m traveling for a long time. So I got to keep my budget as low as possible. I’d recommend getting something in the 6’000+ Baht range though. You get studios that are almost brand new, comfy mattress & so on. It’s worth the extra cash. Hey I just couldnt find Rimdoi place 1 or 2. Are you sure the map locations are correct? Hi Yannik, I’m pretty sure it’s correct yes. However, these buildings are still being finished so they may not be very well indicated in the street. Sorry I can’t help further, I’m not in Chiang Mai anymore. I know this post is quite old by now, but I still wanted to give you an update about the Prestige. 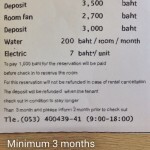 Room rates start at 4700 by now and those rooms are “all full at the moment”… So they start at 5500 baht. At least for now. We’ll be looking into reviewing and updating the current listings soon, as so many more great serviced apartments have popped up in Chiang Mai recently.